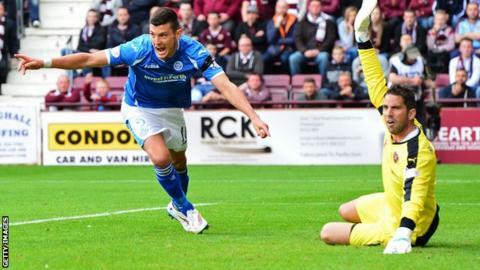 Graham Cummins says becoming an internet sensation when a clip of him trapping his eyelid in a zip went viral helped his settle at St johnstone. The 27-year-old suffered his mishap while changing into his training gear. A clip of Cummins struggling as the zip pinched his eyelid was posted online by team-mate Chris Millar and has been retweeted more than 600 times. "That definitely brought entertainment to the dressing-room; it put me on the map at least," said striker Cummins. The Irish former Preston North End and Exeter city frontman had to go to hospital to have the tracksuit top removed, but the summer signing says it would have been even more painful had he not had such thick skin. "Beside the language barrier, I'm settling in grand," Cummins joked. "I've got on with the lads and had a good few jokes with them. "I like to consider myself an easy person to get on with. I've been made to feel at home - and thankfully there's been no more mishaps with the training gear. "It was such a strange incident. I was literally just putting my top over my head when my eyelid got caught on the zip. I could never do it again. "Even the staff up at the hospital were having a great laugh. They had never seen anything like it. "You just have to laugh when something like that happens. You can't take yourself too serious. "If anything, it has helped me because the other lads see you can take a joke. They are quick to take the mickey, but you can't be a footballer if you can't take a good slagging." Cummins netted just 10 minutes into his Saints debut on Sunday as the Perth side drew themselves level at 3-3 with Hearts at Tynecastle. However, the Edinburgh side clinched a thrilling victory on the opening weekend of the Scottish Premiership with Sam Nicholson's late winner. It was an entertaining introduction to Scottish football for Cummins, but he would welcome a duller affair this weekend when Tommy Wright's side host Inverness if they were guaranteed three points. "I thought I made an impact when I came on, but unfortunately it was Hearts who got the win, which puts a dampener on the goal. "Seven goals in any game is going to be great to watch and the TV company picked the perfect one to televise. But I'd much rather we got a boring 1-0 win against Inverness on Saturday. "It probably wouldn't bring the neutrals back, but we just want to pick up a win. It's like getting your first goal - your first victory can be the most important of the season as it gets you up and running. "But Inverness are in the same boat as us after starting off with a loss, so it will be a tough game."